This horse safari adventure takes you through stunning and varied scenery, as you traverse vast landscapes in both South Africa and Botswana, giving you a flavour of two of this wonderful continent’s fabulous countries. Beginning in the beautiful Waterberg region of South Africa, you will ride through the Matlapeng valley, spotting game and taking in the diverse flora and fauna of the land. Enjoy panoramic views of the Waterberg massif from Camp Davidson, a tented camp set high up in the bushveld, and nestled among dramatic sandstone rocks. 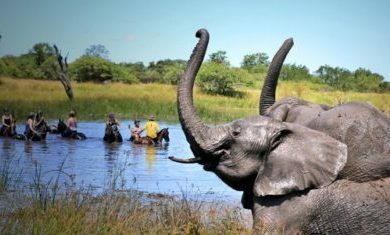 Nip across the border to Botswana and experience the unforgettable horse riding in Mashatu Game Reserve in the Tuli Block of south eastern Botswana. This area offers some magnificent riding, with a great variety of landscapes; featuring stunning vistas, ancient civilizations and dramatic rock formations bordered by the great Limpopo River. This “Land of the Giants” lives up to its name, boasting baobab studded plains and large herds of elephant, situated in some of the world’s last true wilderness and landscapes largely untouched by man. The area is home to a variety of wildlife species including lion, cheetah, leopard, African wild dog, elephant a multitude of plains game like zebra, wildebeest and giraffe, as well as over 350 species of birds. 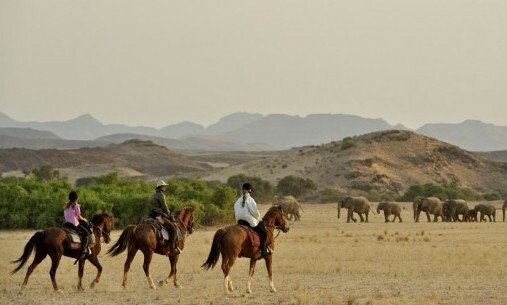 Experience the unparalleled and thrilling feeling of riding alongside some Africa’s most treasured game, set to the backdrop of some of its most iconic landscapes. 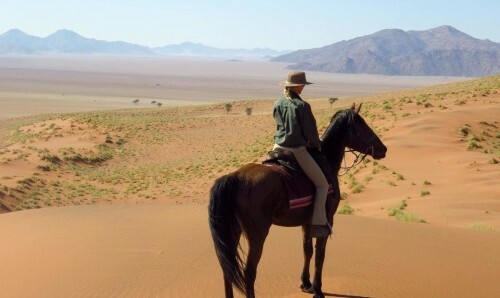 Picture two magnificent countries, stunning vistas, excellent game viewing, fabulous sundowners, unbelievable riding and you’ve got the African Adventurer Ride – a horse safari you will never forget. The Waterberg is an exceptional and internationally recognised natural heritage site. The area offers unique wilderness with stunning panoramic views, dramatic gorges, rolling hills and crystal clear streams. The Waterberg’s iconic beauty and bio diversity has been acknowledged worldwide, being awarded the status of a World Biosphere reserve by UNESCO and the only savannah biosphere in the world. Horizon Lodge is based on a small working ranch in the depths of the Waterberg. The ranch itself has a large herd of cattle and the ranch and neighbouring reserves are home to giraffe, hippo, jackal, hartebeest, impala, kuda, zebra and baboon. Camp Davidson is a half days ride away and set up high in the bushveld, above the Matlapeng Valley. Please be aware that this is a sample itinerary and due to changes in weather and other unforeseen events it may be changed at the last minute but any changes will always be made in your best interests. Day 1: Arrive at Johannesburg International Airport and meet a transfer which will take you to Camp Davidson in time for a delicious lunch. 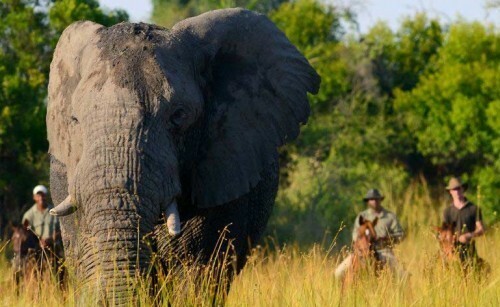 In the afternoon, get introduced to your safari team and guides, both two and four-legged. 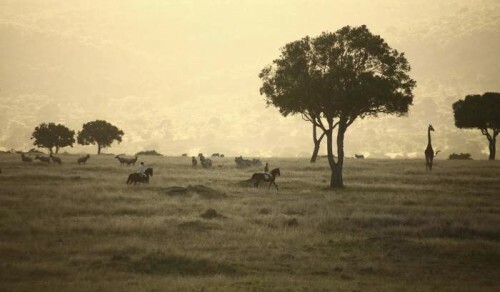 Once you have been matched to a suitable steed, you will set out for your first ride through the beautiful Matlapeng reserve. End the ride with sundowners at Red Lake, where you are likely to encounter the pod of resident hippo, before climbing the ridge back to Camp Davidson. Day 2: After waking up to a glorious African morning and delicious breakfast, spend the day exploring the reserve, tracking herds of giraffe, zebra, eland, wildebeest, kudu and impala. 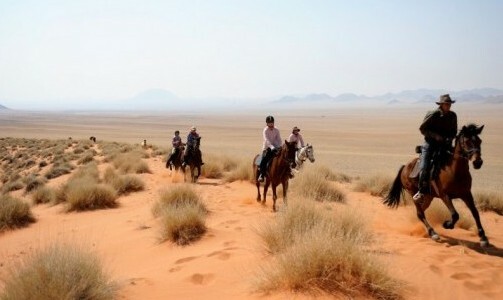 Follow game trails as you weave through the bush and enjoy some long canters across the plains. Experience a saddlebag lunch in the style of Africa’s early pioneers, on the riverbank along an abandoned wagon route. 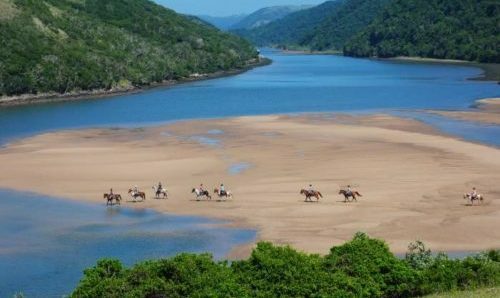 Whilst the horses graze, take the opportunity to hide from the day’s heat in the shady riverine or cool off by taking a refreshing dip in the clear flowing streams. 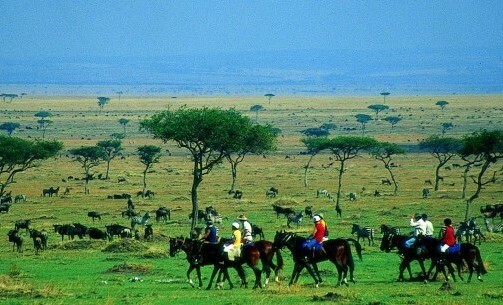 Mount up once more to meander back through the plains which will be doused in the magical light of an African afternoon. Day 3: Today you will ride out west of camp and make your way to the historic Baber homestead, where a delicious lunch will be served by the pool. After lunch and some down time, you will have the chance to visit the local Sotho village and tour some of the traditional houses. Introductions are made with some of the local characters such as Martha Mosima, and the group of village lady elders, for afternoon tea which is accompanied by traditional singing and dancing. You will return to Camp Davidson that evening, beautifully exhausted from a long and fulfilling day in the saddle, complimented by some African culture and history, to find a sumptuous meal served under the stars. Day 4: Wake up with the sun and take a game drive in the Big Five private game reserve, with a chance to see rhino, lion, elephant, buffalo and leopard. On the way back visit Beadle, a craft workshop on the ranch which has a community upliftment project that’s been in operation since 1998. The crafters specialise in beautiful handmade beadwork and leather products including riding chaps. A relaxing lunch will be served by the pool at the Horizon lodge, before heading back to Camp Davidson for a sundowner ride in the game reserve. Day 5: After an early breakfast, break camp and set out for a last ride through the reserve, soaking up the peaceful early morning sights and sounds of the African bush. 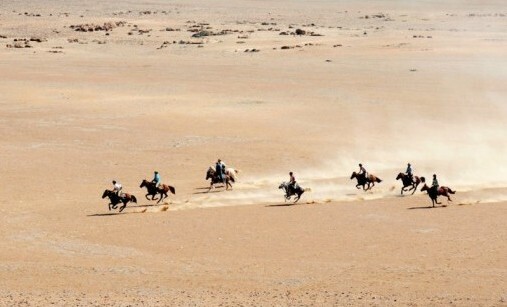 You will reach Horizon Lodge, dismount and depart from the lodge once more a 7:30, heading for Botswana. 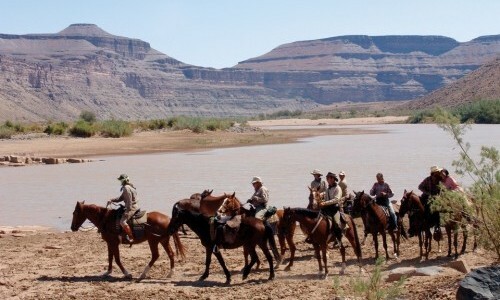 Crossing the Limpopo River into the Tuli block, an exciting experience in itself, you will arrive at the stables in time for an introductory afternoon ride. Once you’ve been paired up with a suitable horse, head out for the second leg of the safari, arriving at the Two Mashatus camp in time to freshen up before supper. Day 6: Wake up with a steaming cup of tea or coffee being brought to your tent, followed by a cosy breakfast around the campfire. An early start is imperative to capture those fresh African mornings and maximise game-viewing opportunities in the hours that the wildlife is most active. The chances are strong that you will encounter the large herds of elephants famous in the area, as well as many different species of antelope; also giraffe, zebra, bat-eared fox, jackal, hyena and possibly even lion, leopard, wild dog and cheetah if you’re lucky. In the afternoon, take in the sights and sounds of the Limpopo River as you ride along the banks, enjoying the rich birdlife, spotting crocodiles in the pools and learning about the magnificent trees in the area. If you fancy a break from the saddle, take a game drive, game walk or visit the local village Mothabaneng to see the village ladies making baskets and check out the bushman paintings. Day 7: Wake up itching to get back in the saddle and head out, following the movements of the wildlife in the area and keeping those eyes peeled for game. The excellent riding terrain invites a varied tempo and allows you to release your inner cowboy and enjoy some long and free canters. Day 8: Waking up to the dawn chorus, enjoy breakfast, before setting out for a last special ride back to the stables where you will bid a sad farewell to your four-legged companion. There will be time for a quick shower and brunch before heading back to Johannesburg International via Pontdrift border post. Rides run every Friday to Friday. Please enquire to find out exact 2018 and 2019 dates and availability. Private tents are available on request but require an additional single supplement. Shared road transfers from Johannesburg to Camp Davidson, from Camp Davidson to Limpopo and from Limpopo back to Johannesburg cost £285 per person. Private transfers can be arranged but will be at a higher cost. The camp is made up of canvas tents set on a wooden deck and nestled in the sandstone ridges overlooking the valley. Each tent has comfortable beds and an en suite bathroom area with the traditional bucket showers. There are jug and basin hand wash facilities and flushing toilets. Camp Davidson is even complete with a small pool in which to cool off after a morning in the saddle.